The Memphis Showboats of the United States Football League had their work cut out for them as they faced the Birmingham Stallions on May 3, 1985. Coached by the colorful Pepper Rodgers, the Showboats were 6-4 in their second USFL season, but had stumbled after getting off to a 4-0 start. 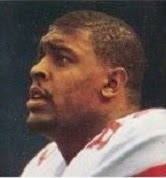 The defense, which featured DE Reggie White, was benefiting from the addition of rookies Leonard Coleman at cornerback and safety Mossy Cade. 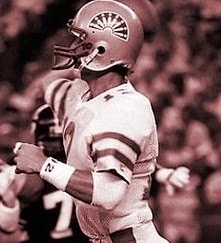 The offense was slipping, however, and Mike Kelley (pictured above) had replaced Walter Lewis at quarterback the previous week. Birmingham was a formidable adversary, tied for first place atop the USFL’s Eastern Conference with New Jersey and Tampa Bay at 7-3. The Stallions, under Head Coach Rollie Dotsch, were a well-balanced team with a productive offense guided by QB Cliff Stoudt and featuring RB Joe Cribbs and WR Jim Smith, while the tough defense was one of the league’s best. Moreover, Memphis had lost to them in each of the three previous meetings between the clubs. There were 29,025 fans in attendance for the Friday night game at the Liberty Bowl. On their first play from scrimmage, the Showboats lined up in a spread formation with both quarterbacks, Mike Kelley and Walter Lewis, in the backfield. Lewis, after faking to Kelley, ran around end for 22 yards to the Memphis 43 and spurred a six-play, 79-yard drive that concluded with Kelley throwing to TE Mark Raugh for a touchdown from five yards out. Alan Duncan added the extra point. Late in the first quarter, the Memphis defense stopped the Stallions near the goal line and Birmingham settled for a 31-yard field goal by Danny Miller. However, the Showboats fumbled away the ensuing kickoff and less than a minute later the Stallions scored again, this time on a pass from Cliff Stoudt to WR Ken Toler that covered 34 yards. The extra point attempt failed, but Birmingham was in front by 9-7. In the second quarter, Kelley tossed another scoring pass for the Showboats, this time covering nine yards to WR Derrick Crawford to finish off a 55-yard possession. Alan Duncan again added the PAT and his 20-yard field goal later in the period improved the Memphis lead to 17-9. The Stallions fought back as Stoudt threw to Jim Smith for a 15-yard TD with 30 seconds remaining in the half and was followed by a Stoudt toss to Toler for two points, tying the contest at 17-17 going into halftime. Four minutes into the third quarter, the Showboats took advantage of a Birmingham fumble to regain the lead as RB Harry Sydney ran 18 yards for a touchdown. Early in the fourth quarter, Sydney scored again, this time gaining the final yard to cap a 62-yard series. It got worse for the Stallions on their next possession. Stoudt, under a heavy rush, fumbled and Reggie White (pictured at left) recovered and returned it 20 yards for another Memphis TD. All of Duncan’s extra point attempts were successfully added, thus giving the home team a sizable lead of 38-17. The Stallions finally put a scoring drive together later in the final period, going 72 yards in 11 plays that ended with Stoudt throwing to Toler for an 18-yard touchdown, but by then the outcome was a foregone conclusion. The Showboats came away with a convincing 38-24 upset win. The Showboats had the edge in total yards (320 to 315) while both teams accumulated 19 first downs. The Memphis defense did a fine job against the normally-proficient running game of the Stallions, holding them to 88 yards on the ground. Each club also turned the ball over two times and time of possession was nearly even with Memphis holding a 30:51 to 29:09 edge. The Showboats accounted for the only two sacks of the game. Mike Kelley completed 21 of 28 passes for 211 yards and two touchdowns while giving up one interception. WR Greg Moser had 5 catches for 72 yards. Harry Sydney topped the Memphis rushers with 37 yards on 8 carries that included two TDs. For the Stallions, Cliff Stoudt was successful on 24 of 33 throws for 240 yards and three TDs with none picked off. Jim Smith had 7 pass receptions for 82 yards and a touchdown. Joe Cribbs rushed for 69 yards on 12 attempts and caught two passes for 29 more. “We made things happen on both sides of the ball,” said an effusive Coach Pepper Rodgers, who called the win the most impressive in the team’s short history. The Showboats won their next two games and five of their last seven to end up at 11-7 and third in the Eastern Conference. They thrashed Denver in the Quarterfinal playoff round before losing to the Oakland Invaders in the Semifinal game. Birmingham recovered to top the conference with a 13-5 record, edging Houston in the Quarterfinal contest before also falling in the Semifinal round, to the eventual-champion Baltimore Stars.